Hans Wegner and who's the Murphy in Murphy Bed? So over the years, I tend to not keep my high end finds, preferring to improve them and send them on their way. I spent last weekend picking up many new items and some will be sold but there are 2 that will be staying with me! I am super excited to be able to take in a Ry Mobler- Hans Wegner designed teak Murphy Bed with shelving system that includes a secretary. It was offered to many other dealers and because it is such a specialized piece, no one wanted to take on the risk and of course, the effort that goes along with bringing the piece up to snuff to sell. 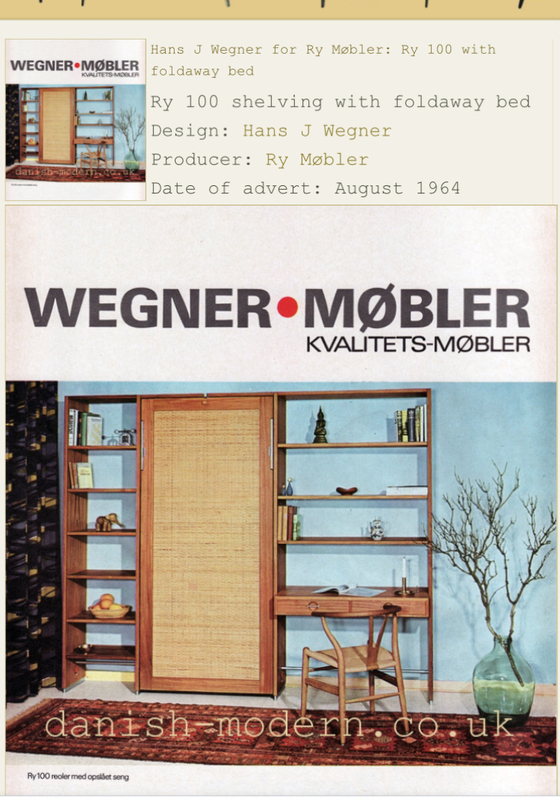 It totally is rare and also, many of these dealers did not trust it was a legit Wegner design. We all know he did work for Ry Mobler, but unless you find a catalog or ad, you can never assume that a designer who worked for a company designed everything they put out. So with that said, I picked up the piece where it was being stored and got it home. In the mean time, I spent some time considering using it in my son’s room rather then selling. Sure, it could be worth thousands in my retail markets, but my son also lives in our smallest room and having a built in desk area would be nice plus when he leaves for college in 7 years, the option of folding a bed up into the wall is very appealing. Murphy beds are quite popular in the NYC market and my former job at the millwork shop produced more than one custom bed for clients. The hardware itself to accommodate the bed was probably a grand alone at cost. I welcomed the opportunity to host this piece in my home and also know that in 10-20 years, it may be worth even more. One evaluation, my husband and I made a mental list of what needs to be done to bring the piece back. The finish needs some work and I am thinking a light sand, danish oil and then sealed with a top coat. I am going to do some research. I want the finish to be durable and have a sheet to it that danish oil alone does not give. The leather loop at the top of the bed deteriorated and broke off. I immediately thought of the saddle shop near us that works with leather to have one recreated, but my husband suggested looking for a leather belt in that size at a thrift shop. Why did I not think of that? So I plan on grabbing the piece next time I hit the thrift store to see what I can find. It just needs to make a grab loop and will be easy to recreate by punching a hole through the ends and re securing it to the screw. Also under consideration is a system of mounting the cabinet to the wall. We all know 1963 (as dated on the piece) was not a super child friendly period and I also read that since the inception of the Murphy Bed. The bed is named for William Lawrence Murphy (1876 – May 23, 1957), who applied for his first patents around 1900. According to legend, he was wooing an opera singer, but living in a one-room apartment in San Francisco, and the moral code of the time frowned upon a woman entering a man’s bedroom. Murphy’s invention converted his bedroom into a parlor, enabling him to entertain. Earlier foldup beds had existed, and were even available through the Sears, Roebuck & Co. catalog, but Murphy introduced pivot and counterbalanced designs for which he received a series of patents, including one for a “Disappearing Bed” on June 18, 1912 and another for a “Design for a Bed” on June 27, 1916. Murphy beds are used for space-saving purposes, much like trundle beds, and are popular where floor space is limited, such as small homes, apartments, hotels, mobile homes and college dormitories. In recent years, Murphy bed units have included options such as lighting, storage cabinets, and office components. They have seen a resurgence in popularity in the early 2010s due to the weak economy, with children moving back in with their parents and families choosing to renovate homes rather than purchasing larger ones. The closed bed features a beautiful rattan panel, leather grab loop which we are recreating, straps that will secure the mattress when lifting and a nice latch that holds it all in place. We will need to replace one of the straps and add a buckle. The bed will fit right into the cabinet. The original mattress was pitched and I would not have used it anyway, but it would have been nice to have to recreate one. We hope to jam Trent’s ikea mattress in as it is a few inches too wide. Length, however, is perfect! So my next step was to prove the provenance of the piece. This is not always easy. I use lots of tools on the web and spend lots of time searching. Sometimes I get lucky and turn up the proof, sometimes, I do not. This took me about 24 hours to turn up, but I managed to find the original 1964 ad for this piece which did attribute the design to Hans Wagner. So think about this….you can probably go to any decent art museum in a city near you, and find something of Hans Wagner on display because he certainly was one of the mid 20th century greats. And now I own one of his pieces! It’s crazy and I am so thrilled. Apparently George Tanier imported many high end pieces from Denmark. If you find his stamp on your piece that is a good sign it is a better piece. Ry Mobler stamp which is also on the piece. I will say the construction is teak board under teak veneer. There is no MDF in this piece. Most danish casework does use veneer over MDF and that practice is still being used today as my job built $300,000 kitchens made the same way. MDF if a very strong substrate. Solid teak board today would cost a fortune and it would be crazy expensive to recreate this piece in today’s exotic wood market. See the grain in the wood? You can tell it is solid board and not mdf (medium density fiberboard) where you would notice shredded pieces of board were glued together and foamed into a new board, usually with formaldehyde. I will keep you all posted on my progress on the piece as I work on it. My son cannot wait to move it into his room! My next weekend rescue has been in the works for a year. I finally picked up my future couch! This amazing Craft Associates piece spent the last 25 years in a barn. We pulled it out on Sunday and literally unearthed it. I am not ready to take it for upholstery work but I have lots to do before I get that far. It is moldy and will require some extra rehab projects that I can start working on a while. It is safely in my garage and hopefully drying out. Will be documenting this process as well. Stay tuned! My first project will be removing the walnut facade and cabinet. I can work on refinishing the wood, eradicating the mold and replacing some bad MDF in the cabinet bottom. We will need to remove the steel support bars, clean up the rust and repaint. I will also look for replacement casters and either sourcing walnut legs or having them turned. The end result is going to be worth the work! NOW FOR MY NEW INVENTORY ITEMS! Set of 4 Farstrup Mobler dining chairs. I will custom recover the seats in fabric you choose from my stash, black vinyl or I can source something for you to order. They are listed in the Etsy shop, coming to chairish. Amazing hard to find Thonet arm chair designed by Pierre Paulin in cobalt! It is not perfect but in usable condition. Retains inventory tag from York Graphics. I picked this awesome 20s/30s era deck lounger up the other week and made a new seat out of indoor/outdoor fabric from F Schumacher. It is now available in my Etsy shop. This great set needs some rehab before I list them but I love these mid century transitional styles and the cane is on point. IF YOU ARE LOOKING TO ADD SOME FINE FURNISHINGS TO YOUR HOME PRIOR TO THE HOLIDAYS OR PURCHASE A GIFT......please make your selection soon as it may take up to 8 weeks to arrive if I have to ship with a shipper or Greyhound. Don’t be scared, I am here to help you the entire way! I would love to help you select the perfect piece! THANKS FOR FOLLOWING! I am continuing my sale at the Mall space this week. Please grab some fun kitschy decor items at my rock bottom price. 20% off one item, 30% off multiples!